The time has come to finally write the final chapter of Niche Site Project 1 and 2. As you may know, both of these projects were public projects where I built a website from scratch and shared the results and everything here on NichePursuits.com. The first Niche Site Project began at the beginning of 2013; shortly after the big Panda and Penguin Google updates. During this project I built the site BestSurvivalKnifeGuide.com (no longer an active site). I was able to quickly get the site ranked #1 in Google for the term “best survival knife” and was making over $800 a month. The second Niche Site Project began mid-2013, and was also a huge success. I actually chose a Niche Pursuits reader (Perrin) to be my student and I coached him through the process of building a niche site from scratch. We built the site aPennyShaved.com. This site quickly ranked #1 in Google for the term “best safety razor” (and many others). At it's peak, the site was earning about $4,000 a month! 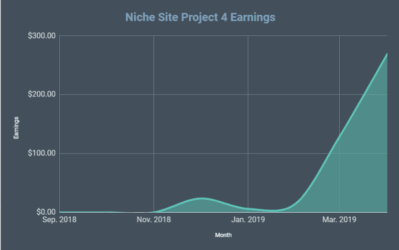 However, if you have been reading along with these niche site projects, you know that there have been some bumps in the road and the sites did not stay at their peak earnings. Even though I have written posts that explained what happened to both sites, I think it's time to finalize both projects. So, keep reading to discover the conclusion of both Niche Site Projects. What Happened to Niche Site Project 1: BestSurvivalKnifeGuide.com? I am going to do my best to provide a quick recap on a project that started almost 3 years ago. Early on in the project, I noticed that there were links being built to my site that I did not build or request to be built. I feared that my site was being targeted by negative SEO. Try as I might, there was nothing that I could do from the spammy links that continued to pop up. The project moved on, and I was still able to hold onto my number one spot in Google for a number of months. However, the dreaded day came when the negative SEO links pointing at my site finally took effect and my site started dropping in Google. The drop came on October 4th, 2013 when Google Penguin 2.1 was released. (This Google update was a links update…so it's pretty clear the the negative SEO links were finally recognized by Google and my site dropped). I wrote about this at length here. However, just to confirm what was going on, I brought in a links expert to analyze the link profile of my Survival Knife site. Sure enough, he confirmed what I had suspected, my site had been penalized due to spammy links. That expert wrote a full guest post on his findings right here. At this point, the case study was essentially over. However, I still put in lots of effort to try and recover the site. I saw no results from my above efforts, so I took the drastic step of moving to a brand new domain. I did not 301 redirect any of the links, I just moved the content. I thought I was starting to see a recovery; however, it was short lived and not permanent. The traffic continued to die to the site. Despite all my efforts for about a year trying to recover the site, I just could not get traffic back to the site. Rather than spend more time on a site that wasn't earning much money, I gave up on the project. Because this was a public project, I would still get contacted by Niche Pursuits readers that were interested in what was going on. One reader had a site in a similar niche and asked if he could buy all the content from my site. We a had a long discussion, and I was finally at a point where I was ready to just let go. As a result, I sold all the content on the site for $900 (I believe), and completely deindexed my site. The new owner of the content was able to take it and publish it on Google as though it was fresh (because I had deindexed the content previously from Google). As a result, I no longer have a site in the survival knife niche and this project is officially over! In total, I made about $6,000 from the site while it was up and running. 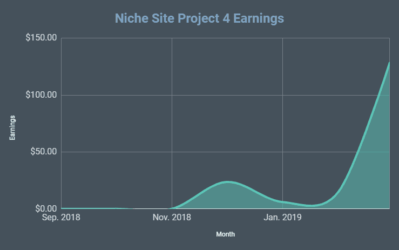 More than the earnings though, I think the case study was quite valuable as it really did show step by step how anyone can build a niche site from scratch. I faced some additional challenges because I ran the site so publicly, and that publicity eventually proved to be its downfall with all the negative SEO links. What Happened to Niche Site Project 2: aPennyShaved.com? The first niche site project was such a fan favorite, that I decided to do a second project with a twist. In the second project, I wanted to coach someone else on building a niche site. I wanted to prove that we could start from scratch again and build another successful site. After getting lots of feedback and opinions from Niche Pursuits readers, I finally picked Perrin Carrell as my student! (Perrin has since now become my full-time employee because I loved the work he did during the project). The project went VERY well this time. 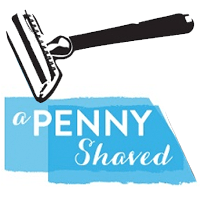 The site aPennyShaved.com quickly ranked #1 in Google for one of our chosen keywords, “best safety razor”. However, we continued to do additional keyword research and content creation, and the site began ranking for thousands of different keywords. By March 2014, the niche site project site was earning over $2,000 per month. This was more money than Perrin had every made (by far) from any of his sites. As a result, we started to get a little bit nervous about sharing everything so publicly. We stopped providing earnings updates after March, because we were kinda hoping people would “forget” about it. We were nervous about someone doing negative seo on the site like someone had done on BestSurvivalKnifeGuide.com. Even though we stopped sharing earnings reports, the site continued to grow in earnings…a lot. 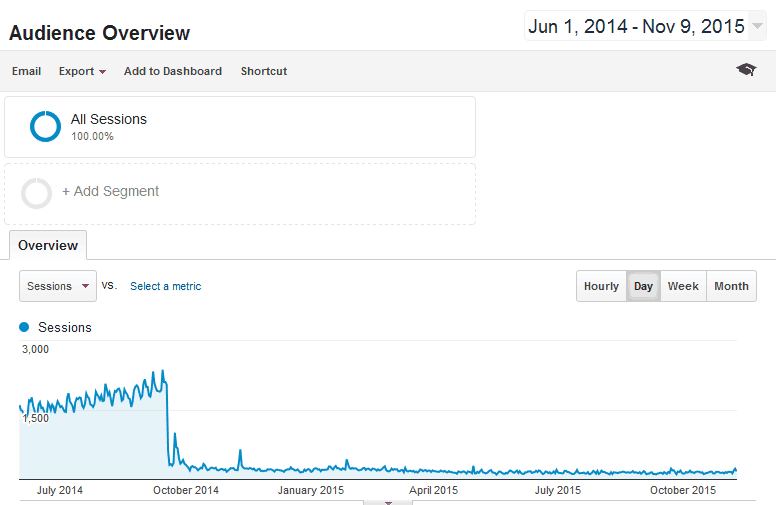 In fact, at its peak in August 2014, the site made nearly $4,000 in one month! Perrin and I were doing lots of happy dances privately, and we hoped the gravy train would continue. However, during the project we had jumped on the Private Blog Network bandwagon and that eventually proved to be our downfall. I wrote about this PBN update extensively, and swore off ever building another single PBN link. (And for the record I STILL have not built or even been tempted to build another PBN link). At the end of the day, we shot ourselves in the foot with our own link building strategies. We did everything right in terms of keyword research, strategy, and content production; however, as soon as we tried to take the easy route by using PBNs the fun eventually ended. Lesson learned…big time! As a result, Perrin and I have steered WAY clear of any type of link building strategies that could be considered against Google's terms of service. Overall, the project was very successful in terms of earnings for Perrin. In fact, in 2014 alone, the site earned over $22,000 in Amazon revenue. Perrin tried all sorts of recovery efforts including disavowing links, restructuring articles and affiliate links, removing affiliate links completely, and many other things. Despite his efforts, there has been no sign of recovery in over a year. As a result, I'm calling the project officially over! I don't plan on making any additional updates on this project, unless by some miracle there is a turn of events. However, you will be happy to know that Perrin was able to move on, build a new site, and that NEW site is already earning over $2,000 per month and is growing quite well. And obviously we did all this with no PBN links! (I talked about Perrin's new site briefly in this blog post here). Overall, the project really was a huge success both in terms of earnings for Perrin and as a training ground for people trying to build their own niche sites. I've had TONS of people email me and tell me that as a result of this project they were able to start a site, rank in Google, and continue to earn good money from it. Having said all that, the Niche Site Project 2 is now officially closed! What About Niche Site Project 3? Wait, what?! Is this an announcement?? I have been doing a lot of thinking lately and I think the time has finally come to do a Niche Site Project 3! I will be sharing more details in a couple of days, so stay tuned. For now, I will simply say that the plan is indeed to do another public niche site project that we can all learn from. The last niche site project effectively ended over a year ago, and so I think it's finally time to explore what has changed with website building. In fact, in the year since the last project, my team and I have been able to build a few successful websites…all without any “shady” links. (And I recently sold 66% of my Authority Site Project site for $19,076. This is just evidence that we've been able to build a few valuable assets in the past year). The long tail strategies that we employ are still very effective, and I think it's time to finally share those strategies more publicly. Be on the lookout for a blog post very soon! Crazy, I was just reading niche site project 2 today. I love the way the content was built and I am doing the same, but I don’t want to touch any link building, yet. Hoping something natural happens. I just want some success to come my way. BTW, I followed the advice of the first project (poorly) I grabbed a KW that I thought was huge but actually it only got 100 local searches a month. However a long tail KW was in there that I didn’t even know about and had around 2000 per month. I made an average $100 per month for 2 years and recently sold the sight for $1600. Only 1 real article on that site! Your projects really help, I look forward to the new one. And Perrin is an awesome addition! Thanks Bob! Glad to hear that were able to have a taste of success and sell your site for $1600! Absolutely delighted you are doing another niche case study. I don’t have much interest in the Amazon stuff so haven’t been reading as of late but really looking forward to this! Glad to hear your are excited for the niche site case study! It should be a good one. I think you’re still the only site publishing these challenges where everything turns to gold (for a while at least, probably because they’re public). I don’t know if you were going to mention this or not, but when you build out a new site for your ecommerce stuff are you sticking with WordPress or using something like Shopify/BigCom? Thanks for the projects over the years, can’t wait to see what you guys come up with next. Thanks Jamie. We have been trying out a couple different options for our ecommerce site: Ecwid plugin, woocommerce, and now we may try shopify. Our site is starting to gain alot of natural traffic, but we are still just referring people to amazon to checkout. Once we get our setup the way we like it, we’ll share more details. I’ve been following news of the second niche project and i felt bad when you got the hit. Man this stuff is soo coool. I wish I could duplicate myself to work on multiple projects at once. It was these two niche site projects that really got my online marketing juices flowing. I tried doing Niche sites a couple years ago after first reading your blog (and your crazy success), never amounted to much (I hate backlink building). After listening to your interview with Claire and having my mind blown with her zero back-linking strategy I decided to give it a try. It took a couple months for the site to start generating natural organic traffic from the ultra-low competition keywords, but it was starting to work! Then finally, just yesterday I went to check my Amazon affiliate account and saw I made $30 just in the last couple days, and it’s increasing steadily, like someone just turned on a switch. It works! Not huge numbers like yours, but its something. I have been documenting using Clair’s strategy in my own case study (linked to in my name). Can’t wait to post the tally at the end of the month. I’m not sure if I will ever publish the site out of fear of what happened to BestSurvialKifeGuide.com. Quick question on aPennyShaved.com. Did you guys remove all affiliate links on the site, except for the main Amazon affiliate ‘store’ on the stores tab? Thanks Matthew! Cool to hear that the site you havent touched in a while is starting to bring in some sales! Yes, pretty much all affiliate links were removed from apennyshaved in an attempt to help it recover…but that didn’t work. But yeah, I’m excited to follow along with this new project. I’m sure we all can learn a lot from it. I just restarted mine 2 months ago too. Things are going well according to my plan and I’m working hard on it to achieve the $10k goal. Hey Tung! I’m still running the FBA business…but I’m also still running the Long Tail Pro business, the Niche Pursuits business, the Long Tail University business, my niche site business, etc. Guys like you and I never have just one project going on at a time :). Good luck with your site! Looking forward to another Niche Site Project Spencer. Inside scoop for comment readers paying attention…Ben is my brother!! Nice post so hold on is apennyshaved.com still up and running and making money?? Yes. The site still gets 150 to 200 unique visitors a day. Oh ok so its not closed?? maybe you meant the case study is closed but the site is still up and making money right? Funny to hear you were able to sell the content from NSP1,…. too bad the site crashed like that though, it would have been nice to see how it would have done over time. And NSP2 too ofcourse , i can imagine how it must have felt fpr Perrin. Finaly you get a site up and running that actually makes money and then when it shows all the signs of becoming a huge succes it gets burned by Google… aaaargghhhhh devastating.. I can see Perrin getting up in the morning, turning on his computer and then melting away into this little black puddle of misery ( i went through the same thing) Luckely the new pet site is doing great, i wish you 2 all the luck in the world. And NSP3? i can only think of 3 words,…. I love it! Thanks Higgins! Yep, Perrin was pretty bummed for quite a while…but he’s all good now! Great information. Thanks for putting yourself out there. Now it’s something really really exciting! I have started my first niche site following your guidelines a couple of weeks ago and is very hopeful to get some positive results. By the way, how much time it takes (usually) by Google to sent traffic to your site? My site is indexed but has not been ranked yet. How long it takes really depends on how well you’ve chosen your keywords and the quality of your content. However, 2 to 3 months is usually when you should start seeing some google traffic. Thanks for your response, Spencer! Great post and looking forward to Project 3. Nice to hear from you. I am following your niche site project 2 since u started. I am waiting for your next project. Glad to see a #3 is coming! I built a site off niche site #1, was making 2k a month and it was negative SEO as well. Thanks for all the great info Spencer & Perrin! Thanks Josh! 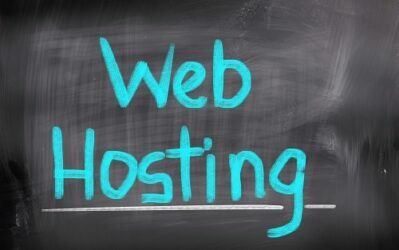 Hopefully we can get you another site making $2k+/mth! Very excited to follow NSP3; I’m super curious how you guys will teach efficient linkbuilding. This will be fun! Thanks Eric! I know so many people think the secret is link building, but it really isn’t. I’m sure we will talk some about link building, but its never a focus…I prefer almost to go the no link building route completely. Wow, this sure comes in handy Spencer!! And time as come to start getting traffic from Google (on my NSP’s updates there is a delay — sorry folks! — I already have a site running with some content). Fact is, I was wondering what link building opportunities are there for my new site. I know I need to forget about PBNs, so… how to do it? (BTW, when you have time… — I know you don’t — please update your autoresponder series, there a few outdated tips there concerning link building). So I guess I’ll be your NSP3 #1 fan! Thanks for the update on the niche site projects. I got started building websites after hearing you speak about niche site project 1 on smart passive income. Without any shady linking and around a year of hard work my first site started ranking very well and is now the dominate site in the niche and is ranking for most short keywords. The site has been consistently making over $2000 a month since the middle of last year and after the boost of holiday traffic affiliate income has jumped into the $4000-$5000 range. Thank you for opening up this world to me and I have been buying sites on flippa and building new ones for awhile, almost to the point that I can drop my day job. Some things that I would like to see in then niche site project if it focuses on a physical product that is sold through amazon is how build other sources of traffic beyond google. Also, I would like ideas on building a email autoresponder for a physical product niche. For instance what would you have in an email autoresponder for your now deceased survival knife site. Hi Michael, Now I starting build new niche site that make money from amazon affiliate. I would like to know when your site making $1000 a month and how many article you have at that time? Congrats on your success Michael! I think you will really like NSP 3…I have some ideas that I think will give us opportunity to cover the very topics you mentioned. I may have a post out later this week that explains the project in more detail. I would like to ask you. How long does it take time to get consistent organic traffic ? If my site is from scratch and not need to build any link. All of keyword are KC under 25. Most of them include buying keyword (best/review). You have to build links (technically every BUILT link is frowned upon by Google), but you need to do it. I still use PBN’s and firmly believe if they’re built correctly and it’s not a PUBLIC network, then it minimized your risk but the strategy you use is up to you :). I’m not saying links are bad, just saying that some people choose to not build them and still do fine. A new site from scratch will usually take at least 2 to 3 months before it starts to see much consistent organic traffic. Hi, Would be interested to hear the type of link building that was done for Perrin’s new site! Very great news to hear about NSP3 can’t wait. Hope you will make more video tutorial? And see how you will do linkbilding( hate this 🙁 )? Yes, I’m sure we will have more videos. It seems that niche site is gradually giving way for authority site. I am therefore tempted to ask if niche sites are still viable now? Eagerly awaiting the commencement of the NSP3. That will be great fun. In my book, there is no difference between a “niche site” and an “authority site”. Both start small and hopefully grow large with success. Not sure if that answers your question, but the point is that the niche sites we build eventually have hundreds of articles on them. Sounds great, Spencer! Looking forward the NSP3! I’m not sure if you’re taking suggestions, but I’ll throw them out there anyway: I would love to learn 1) strategies for building a product (and the different types of products you can build), as that seems to be where the big money is; 2) how to figure out what product your audience actually wants to buy; 3) how to build a mailing list (ie, the tools you’d use); and 4) how to use Facebook to get subscribers (as your cousin did with NRSNG.com). Looking forward to wherever the project takes you! Thanks Matthew for the suggestions! I’m always open to suggestions :). Those are some great points, and I definitely think we will tackle some of those in the project. Niche Project 3???? – Super Stoked – Just launched my blog, and 1 of my main streams of income I’m looking to build on is niche sites. Love the work you do, and all the details you provide. To get more information with all the new updates now, would really be amazing. 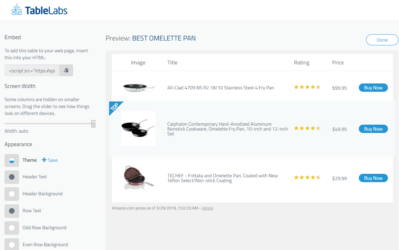 I love LongTailPRO as well – just put it up to platinum! Thanks for all the quality content – keep it up. This is so exciting to me!! I have been on your site NON STOP for the last week reading the Niche Projects 1&2! I have felt out of the loop because these were already passed, but now I feel like I can be a part of this. I have been working very hard on implementing your strategies into my wifes Niche site. Thank you so much for all of your effort to help everyday folks like me and my wife! I can’t wait to follow along with this! Best wishes to you Spencer! Thanks Isaac, glad you can follow along with us! Looking forward to this Spencer! I just started a new site about a month ago, if only I’d of known then i’d of waited haha! However I guess it will have the same basic steps as nsp1 & 2 so I can still go along with my new site I guess =D Keep up the good work. Thanks Aston, there will still be plenty to learn for sure! Awesome Spencer, even though both projects did not go as planned, I learned a heap from both of them, NSP3 In particular. But I have only just gone through in the last 2 months (am a fairly new reader) and would love to see what has changed in your process since then. 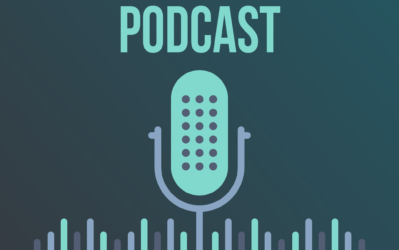 I also wanted to mention I am a big podcast listener and love videos as well. Like those coaching calls you had with Perrin were fantastic! None-the-less, love your work mate! Do you think there is enough trafic or value from affiliate to earn some decent money for a french website? I’m sure there is, lots of french speaking people in the world. Both projects used Amazon to monetize the sites. I was hoping to use Amazon also, but I live in a state, Colorado, which does not allow Amazon affiliates. What are some other options besides Amazon ? Perhaps register a business in a state that does allow affiliates. Yes, it might cost $300 or so to get set up…but a small investment if you think the business has potential. 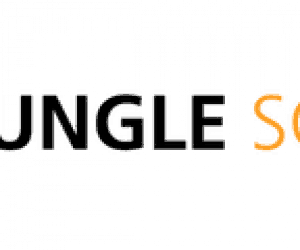 You said that your site on survival knives was targeted by negative SEO/spammy links. Isn’t it possible for that to happen to anyone building a niche website – or any site for that matter? I guess it would be rare – but what is stopping someone from taking out their competition by going after websites in the same manner as happened to you? Then we are all at risk. I’m happy to hear that you’re starting another niche site case study and i will follow you bomber to bomber on this one :). Its really very sad to hear that the two case studies you did before ended in a bad way but, its also good because you were able to learn something priceless from the experience. Will be looking forward for the new case study updates. Been following through your updates for the past 2 months must say its a quality time spent. Am new to niche building my site is 2months old. Adding more contents and learning from your previous NSP 1 and 2. Can’t wait for epistle 3. You are on top of this game. Cheers Spencer.